The Cincinnati Reds head to Chase Field on Saturday, July 8, 2017 to take on the Arizona Diamondbacks. The expected starting pitchers are Luis Castillo for the Reds and Taijuan Walker for the Diamondbacks. The odds for this matchup have Cincinnati at +140 and Arizona at -160. The Reds have a 47-35-3 over/under mark and a 46-39-0 run line record. The Diamondbacks are 48-38-0 against the run line and have a 39-43-4 over/under record. The Reds have a 37-48 overall record this season. Starting pitcher Luis Castillo has a 0-1 record with an earned run average of 4.41 and a WHIP of 1.71. He has 22 strikeouts over his 16.1 innings pitched and he's given up 19 hits. He allows 10.5 hits per 9 innings and he has a FIP of 6.09. The bullpen has an earned run average of 4.04 and they have given up 297 base hits on the year. Teams are hitting .233 against the bullpen and they've struck out 319 hitters and walked 140 batters. As a team, Cincinnati allows 9.1 hits per nine innings while striking out 8 batters per nine innings. They are 30th in the league in team earned run average at 5.2. The Reds pitchers collectively have given up 755 base hits and 431 earned runs. They have allowed 144 home runs this season, ranking them 1st in the league. Cincinnati as a pitching staff has walked 319 batters and struck out 660. They have walked 3.8 men per 9 innings while striking out 8 per 9. They have a team WHIP of 1.44 and their FIP as a unit is 5.34. As a team Cincinnati is hitting .260, good for 11th in the league. The Reds hold a .449 team slugging percentage and an on-base percentage of .327, which is good for 13th in baseball. They rank 9th in MLB with 9.0 hits per game. Adam Duvall is hitting .278 with an on-base percentage of .323. He has 86 hits this season in 309 at bats with 59 runs batted in. He has a slugging percentage of .553 and an OPS+ of 123. Joey Votto is hitting .316 this year and he has an on-base percentage of .426. He has totaled 95 hits and he has driven in 61 men in 301 at bats. His OPS+ is 170 while his slugging percentage is at .625. The Reds have 753 hits, including 145 doubles and 119 home runs. Cincinnati has walked 264 times so far this season and they have struck out 672 times as a unit. They have left 585 men on base and have a team OPS of .776. They score 4.83 runs per contest and have scored a total of 406 runs this year. Arizona has a 52-34 overall mark this year. With an earned run average of 3.30, Taijuan Walker has a 6-3 record and a 1.34 WHIP. He has 68 strikeouts over the 76.1 innings he's pitched. He's also given up 73 hits. He allows 8.6 hits per nine innings and his FIP stands at 3.52. The bullpen has an earned run average of 3.39 and they have given up 222 base hits on the year. Teams are hitting .226 against the Diamondbacks bullpen. Their relievers have struck out 271 batters and walked 99 opposing hitters. As a team, Arizona allows 7.9 hits per nine innings while striking out 9.3 batters per nine innings. They are 2nd in the league in team earned run average at 3.37. The Diamondbacks pitchers as a team have surrendered 673 base knocks and 285 earned runs this season. They have given up 83 home runs this year, which ranks 30th in Major League Baseball. Arizona as a staff has walked 267 hitters and struck out 788 batters. They give up a walk 3.2 times per 9 innings while they strike out 9.3 per 9. Their team WHIP is 1.23 while their FIP as a staff is 3.62. As a team, they are batting .262, good for 9th in the league. The Diamondbacks hold a .446 team slugging percentage and an on-base percentage of .330, which is good for 9th in baseball. They rank 8th in MLB with 9.0 hits per contest. Chris Owings comes into this matchup batting .293 with an OBP of .327. He has 86 hits this year along with 49 RBI in 294 AB's. He maintains a slugging percentage of .497 with an OPS+ of 105. 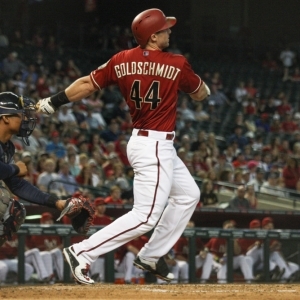 Paul Goldschmidt is hitting .315 this season and he has an OBP of .433. He has collected 95 hits in 302 at bats while driving in 66 runs. He has an OPS+ of 155 and a slugging percentage of .583. The Diamondbacks as a unit have 768 base hits, including 171 doubles and 108 homers. Arizona has walked 282 times this year and they have struck out on 762 occasions. They have had 581 men left on base and have an OPS of .776. They have scored 5.12 runs per game and totaled 435 runs this season. Who will win tonight's Reds/Diamondbacks MLB game against the spread?